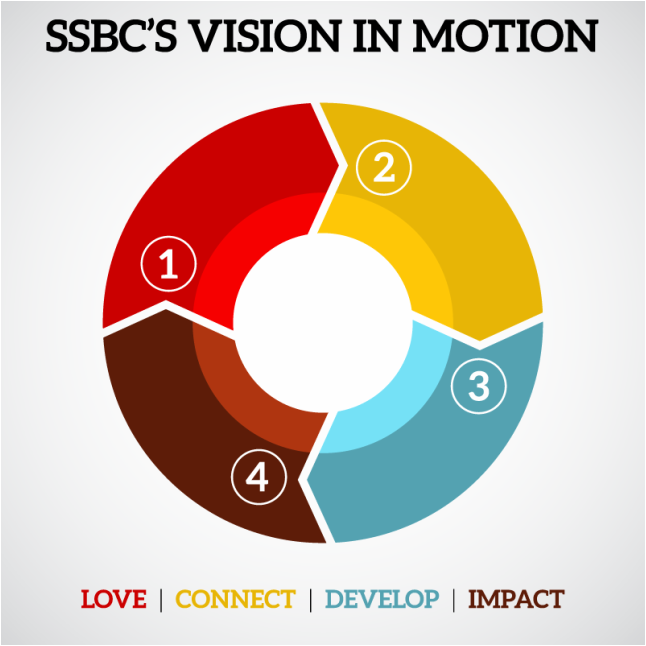 South Side Baptist Church exists to develop passionate followers of Christ. This is accomplished by impacting the world for Christ—one life at a time. Our heartbeat lies in these two sentences. As disciples of Jesus Christ, we are called to LOVE God and LOVE others. This love for God and others is seen by the way we CONNECT with each other through Connect Groups, Sunday morning worship, and other events. However, we are not supposed to stop with fellowship. Jesus calls us to be His disciples, but He also calls us to DEVELOP others and help them become mature followers of Jesus who then develop others. We do all of this so that we might IMPACT South Bend, the state of Indiana, the world for Jesus Christ! 2. We value the Bible as the word of God and our foundation for life. 3. We value every person's need to know Christ and accept our responsibility to share him. 4. We value gathering together to encourage one another in Christ. 5. We value God as the only One worthy of our worship. 6. We value meeting people's needs in order to help them grow in Christ. 7. We value discovering and utilizing our God-given gifts and talents to further the kingdom of God. 8. We value doing all to the glory of God in every aspect of our lives. 9. We value the spiritual development of believers through discipleship. 10. We value the power of prayer—corporately and individually.